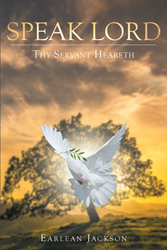 “SPEAK LORD Thy Servant Heareth” from Christian Faith Publishing author Earlean Jackson shares a collection of poetry that reminds readers to hear God’s message. Lost and struggling in a loud world, it is more important than ever to listen for God’s whispers. “SPEAK LORD Thy Servant Heareth”: a reminder to the lost and struggling to listen for God’s voice. “SPEAK LORD Thy Servant Heareth” is the creation of published author, Earlean Jackson. Earlean Jackson is a devoted and loving mother to her four children and two wonderful grandsons. She was widowed after 45 years of marriage. She was raised in a devout Christian home by the late Reverend Cleveland C. Jones and Evangelist Eva Jones. Earlean has always enjoyed singing gospel songs with her four brothers and two sisters, especially during the holidays and at family gatherings. Her mother has inspired her the most through her words of wisdom, creativity, and nurturing. From her own challenges in life, she was inspired to write poems, short plays and speeches. She has performed in a few of the plays she wrote for her church as an elderly lady of wisdom. As a minister of the gospel, she is sincere in her walk with the Lord and has an insatiable appetite for the word of God. Her heart's desire is to do His will, so that people may be blessed by the gift God has entrusted to her. Published by Christian Faith Publishing, Earlean Jackson’s new book reminds readers to listen for the voice of God. God speaks to His Children in many different ways. At some point in life, everyone feels lost as they struggle to choose the right path. Psalms 63 states, "Early will I seek thee." By putting God first and starting the busy day with God, what He has to say can be heard and His guidance turned into prosperity. Even in the midst of a loud and chaotic world, when the sounds of life’s troubles are deafening, a small voice can still be heard whispering, "I am the Lord, I see and I care." God speaks in many different ways through His Words, the sermons of His disciples, songs, and nature itself. View a synopsis of “SPEAK LORD Thy Servant Heareth” on YouTube. Consumers can purchase “SPEAK LORD Thy Servant Heareth” at traditional brick & mortar bookstores, or online at Amazon.com, Apple iTunes store, Kobo or Barnes and Noble. For additional information or inquiries about “SPEAK LORD Thy Servant Heareth”, contact the Christian Faith Publishing media department at 866-554-0919.